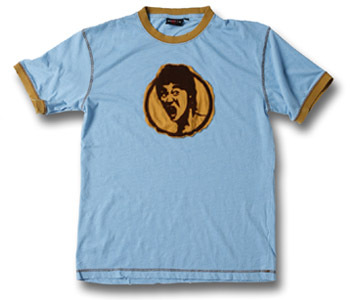 *** Last of this design *** Short sleeve, light blue and brown, heathered, fitted, ringer T-shirt with appliquéd caricature sketch of Bruce Lee's face on a circle outline. The shirt has a "damaged" retro look as if it has been worn for years. Made of comfortable cotton. The fabric and manufacturing of this style of shirt is costlier than most, but we have negotiated a great price with our vendor and are passing the savings it on to you. If you prefer your shirts to be loose fitted then order a size larger than normal. All Bruce Lee merchandise is officially licensed. Love this shirt, extremely soft and comfortable and funny BL print.